World of Warcraft is an online game where players from around the world assume the roles of heroic fantasy characters and explore a virtual world. What is World of Warcraft? World of Warcraft is an online game where players from around the world assume the roles of heroic fantasy characters and explore a virtual world full of mystery, magic, and endless adventure. Among other things,World of Warcraft is a Massively Multiplayer Online Role-Playing Game. Unlike most games, MMORPGs do not have an offline mode; you need to be connected to the Internet while you play. 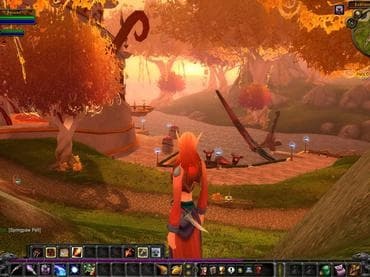 This doesn't mean that you can't enjoy these games alone; World of Warcraft offers plenty of content to players who want to go it solo. In World of Warcraft, each player character has a specific set of skills and abilities that define that character's role. World of Warcraft is a truly massive game. Download free game today and play for free now! Please note that you need to get World of Warcraft Starter Edition with the following restrictions: - Characters cannot exceed level 20, 10 gold, and 100 trade skill ranks; - Characters cannot participate in Pet Battles; - Cannot trade, create or join guilds, invite players into a party, create calendar invites, or disable experience gains; - Cannot use the mailbox or Auction House; - Cannot send whispers unless the Starter Edition character is on the recipient's friends list or the Starter Edition character is replying to a whisper; - If there are login queues, the system will prioritize players who have full licenses; - Starter Edition licenses are not eligible for value added services. Если у Вас есть вопросы, связанные с игрой World of Warcraft пожалуйста используйте эту форму для связи с нами.